We are Authorized Distributor, suppliers, importers for Carlo Gavazzi fotek meanwell. Our Relays India from carlogavazzi is superior brand worldwide since its from the European market so its a proven quality product in India. We have different types of relays ssr, solid state relays,analog solid state relays,single phase relays,three phase relays,reversing relays,monitoring relays, emr relays etc. relays is mainly a switching device but better than contractors our relays are less failure. Carlogavazzi & Fotek relays major customers are presented in all over India. We are covering the following cities like Chennai, Madurai, Coimbatore, Pondicherry, relays Bangalore, Hubli, ssr Hyderabad, Vizag,solid state relay Mumbai, Biwadi,Delhi, Pune, Noida, Haryana, Faridabad, Ghaziabad, ssr Gujarat, Baddi, Indore, Surat, relays Ahmedabad, Vadodara, Vapi, Maharashtra, Kolkata, Westbengal, Udaipur, Jaipur, Punjab, Silvassa, Ludhiana, Kashmir, Goa, Jharkhand, Odisha, etc. 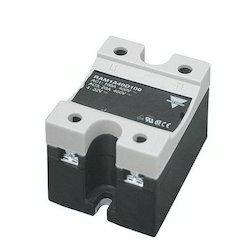 We have gained recognition as an eminent enterprise, devotedly engaged in offering a broad range of Analog Solid State Relay. 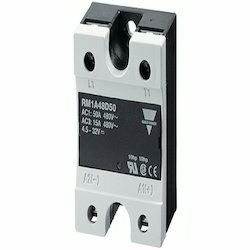 It has been approved by many OEM's for its quality base working and better price level.This relay is designed and manufactured at our vendor’s ultra-modern manufacturing unit using the superb quality raw material and progressive technology in conformance with defined quality standards. Being a quality-oriented organization, we assure our clients that this relay is excellent on counts of durability and quality. Owing to our extensive years of industry experience and profound market understanding, we are providing a wide gamut of Electro Mechanical Relays (EMR). The offered relays are manufactured utilizing superior quality raw material and latest technology. Moreover, a team of our quality controllers conducts a series of quality tests on the entire range to seek out any possible defect. In tune with industry standard, we provide the entire range in various customized options and industry leading prices. SDAPL Ramya, Today 2:42 PM With the constant support of our dexterous crew of professionals, we are fulfilling the varied requirements of clients by offering optimum quality Solid State Relay(SSR). This relay is manufactured using optimum quality raw material and advanced technology. In tune with different requirements of our copious clients, we customize the entire range in various sizes and shapes. Offered relay has gained exceptional value amongst our clients for its defined features.